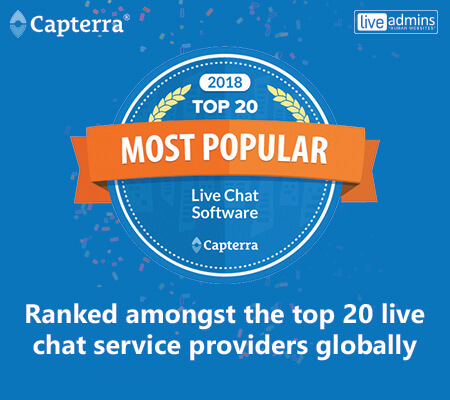 Chicago – IL: May 3, 2018 – LiveAdmins’ proprietary Live Chat solution WebGreeter has been recognized by Capterra, the leading online resource for software buyers, as a Top 20 Most Popular Live Chat Software product for 2018. “From day one, our focus has been to improve the online users’ experience while generating viable leads for our customers. This recognition fortifies our commitment to providing 24/7 managed sales solution backed by our dedicated team of chat agents,” said Brian Smith, General Manager at LiveAdmins. To see the complete solutions offered by LiveAdmins, click here.